The first ever Star Wars Celebration was launched on this day eighteen years ago. 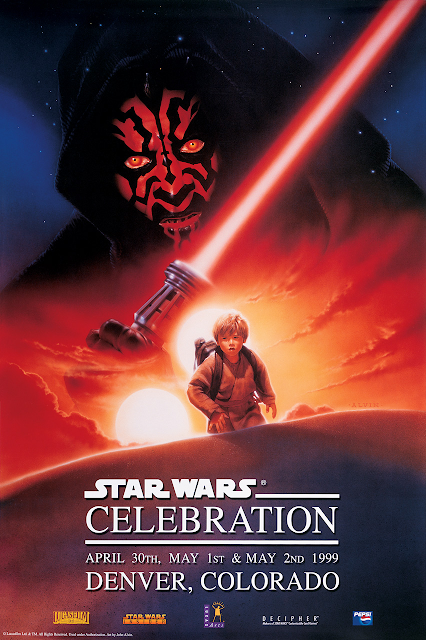 The inaugural Celebration took place just weeks prior to the release of The Phantom Menace, from April 30 to May 2, 1999. Star Wars Celebration is a fan convention focused on the ever-expanding Star Wars universe which is sponsored by Lucasfilm. The convention was organised by the then events director Dan Madsen, head of the Star Wars Fan Club, at the Wings Over the Rockies Air and Space Museum in Denver, Colorado. The world premiere of the Duel of the Fates music video was played at Celebration along with special behind-the-scenes footage from Episode I. The 20,000 Celebration attendees were able to visit a museum which exhibited props from the official LucasFilm archives, including a full-scale model of Anakin Skywalker's podracer and a life-size X-wing model. Star Wars Celebration 2019 will be the 13th Star Wars fan convention, whilst last month's Celebration in Orlando was the 8th located in the United States of America. What memories do you have of the first ever Star Wars Celebration?